When I booked my flight to Brussels one of my first thoughts was, “Wait, are Belgian waffles really a thing in Belgium?” I was really hoping that they were, and when I arrived I was ecstatic to discover shop upon shop upon shop with waffle displays like these. Ummmmm... I'll take one of each. If only. I opted for a Belgian waffle doused in Belgian chocolate (it was hard not to choose nutella, but when in Belgium...). Meant to be eaten as an after meal dessert (definitely not for a meal and definitely not for breakfast! ), the Brussels waffle is identifiable by it's rectangular shape and deep, uniform squares. These waffles are made using a thin batter usually including yeast rather than baking soda and they are light and crisp. The Brussels waffle is meant to be enjoyed with a variety of toppings from chocolate to strawberries, whipped cream, ice cream, powdered sugar, or anything else you can dream up. The proper way to eat them, however, is sitting down with a fork and a knife. Here's the best place to buy a Brussels Waffle. Quite different from the Brussels waffle, the Liège waffle is made with dense bread-like batter that has to be spread into the waffle maker. The dense dough is filled with pearl sugar, which is essentially clumped together cane sugar. These sugar crystals caramelize both inside and outside the waffle as it cooks, creating a sweet, sticky, chewy waffle meant to be enjoyed unaltered. 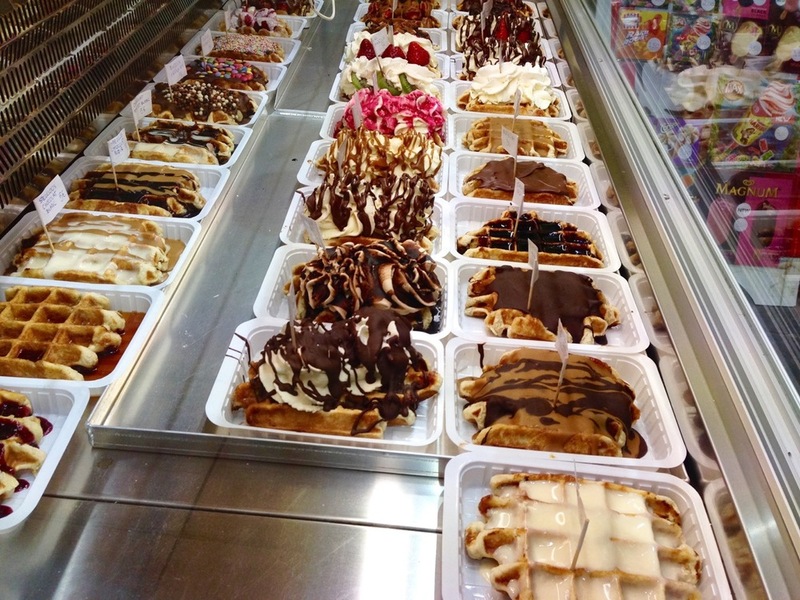 These waffles are sold all over the city, from inside sit down restaurants to street vendor stalls, and to eat a Liège waffle like the locals you should buy it from a van and eat it as a snack right out of the wax sleeve it's served in. Eat as many waffles as possible. Eat your waffles whatever way you find most delicious. Take pictures so you can look back on your waffle eating marathon and remember the good times. P.S. Per usual, I created a one-day guide to Belgium. Your trip: Planned. Enjoy getting your night back!